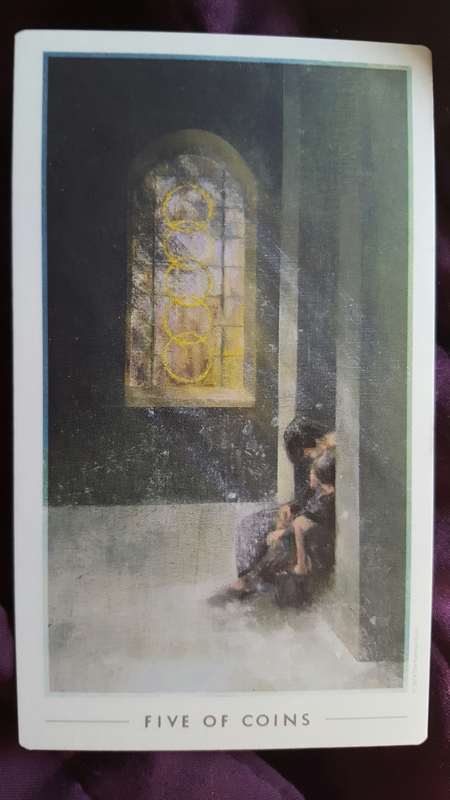 Today’s card is one of both hardship and hope. Here we have two people huddling together, looking dejected and lonely – as if all hope is lost and nothing can be done. They’re taking comfort in each other and are focused inward, most likely their thoughts are on their problems and all of the suffering they’ve endured. They appear to have given up. What they fail to see in their introspection is the wondrous light shining on them through the window. We can see that outside the sky is blue and the trees are green – everything looks warm and inviting. Here is life and happiness. If they were to look up, they would see that there is hope for them. Things can get better! Throughout our lives, we suffer. Periodically, we may find ourselves in unexpected places that cause us to feel sad, lonely, or ready to give up. If you’re currently dealing with these feelings or you’re in a situation that looks hopeless, know that hope is shining on you today. This is not the end. Take some slow deep breaths, look up, seek out the help that is available to you, and don’t give up! I believe in you!